In 2012, Mi-Corporation began working with New York University College of Dentistry (NYUCD) on a mobile data capture project used to collect, track, and report on the oral health of children and adults from around the world. The mobile team at NYUCD's Office of Global Outreach recently returned from a rural site about four hours from Jaipur in Rajasthan, India, where they provided free dental exams,collected data, and provided preventative oral health services to nearly 200 children and 100 adults. Like all of their sites, they plan to return soon to continue to provide clinical care to those in need. The ongoing care and service provided by the team at NYUCD is truly inspiring, and we are so honored to know and work with such a humble, hard-working, and passionate group of people. 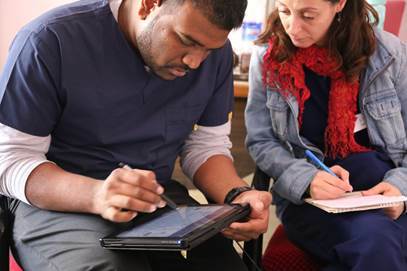 For more than three years, the team at NYUCD's Office of Global Outreach has utilized Mi-Corporation's Mi-Forms solution to successfully develop protocols and standardize data collection methods at their mobile sites. Currently, the team is tracking close to 4,500 children in the United States (Maine and New York) and in many countries around the world such as Ecuador, India, Mexico, Nepal, and Nicaragua -- and they're continuing to identify further opportunities in the U.S., Armenia, and Chile. The team at NYUCD is constantly working to refine their project as they learn how to best capture relevant information that can be used to both improve the standard of care provided and the systemic health of the children visiting NYUCD's clinics. "We want you to know that the software application [Mi-Corporation] tailored for NYUCD's Office of Global Outreach has been invaluable to the development of our global outreach programs." While the service provided would not be possible without the fantastic group of individuals at NYUCD's Office of Global Outreach, we are happy to play even a small role in making such a difference in the lives of others, and are proud to help NYUCD make a positive impact on the world with our technology. Support Global Outreach by making a gift.